Baiduri Cardholders don’t need to brood about where to shop for their preparations for the coming of Year of the Rooster. Baiduri Bank is collaborating with Hua Ho Department Store to offer great rewards and savings for customers who use their Baiduri Credit and Debit Card for their purchases in their Delima, Gadong 2, Kiulap, Mulaut and Tutong outlets. On two weekends in January, namely on the 13 to 15th January 2017, as well as on 20th to 23rd January, customers who shop with their Baiduri Credit or Debit Card are rewarded with 1 chance in a sure-win lucky dip for every BND100 spent. In the lucky dip, customers stand a chance to win vouchers worth BND5, BND10, BND20, BND50 and BND100 and chances are subject to a maximum 3 chances with BND300 spent in a single receipt. Terms and conditions of the promotion can be viewed on Baiduri Bank website at www.baiduri.com under the Promotions section, or on the Baiduri Bank mobile app – Baiduri Deals. For more information, customers may also contact the Baiduri Bank Customer Helpline at 2449666.To be in the know of Baiduri Bank current promotions and events, the public can also like the official Baiduri Bank Group Facebook page or follow @baiduribank on Instagram and Twitter. Bank Islam Brunei Darussalam (BIBD) was recently announced as the strongest bank in Brunei by The Asian Banker (TAB), and one of the strongest in Asia Pacific on par with top international banks from Hong Kong, Malaysia and China. In a list of 500 of Asia Pacific’s Strongest Banks by Balance Sheet, BIBD remains the only Bruneian bank to be featured within The Asian Banker’s 500’s ranking of the Asia Pacific’s top financial institutions. With a strong aggregate strength score, BIBD also scored top marks in its Assets over GDP, Liquidity and Credit Adequacy Ratio, while scoring highly in the Financing-to-Deposit Ratio , and Return on Asset ratio. BIBD holds the 14th spot among the strongest banks in Asia Pacific for 2016. The recognition given TAB, a leading provider of strategic intelligence on the financial services industry in the region, is based on the Bank’s 2016 balance sheet. The award is BIBD’s third recognition from TAB this year after receiving The Best Retail Bank in Brunei, and the region’s Best Smart Branch Project earlier. According to TAB, BIBD has maintained high levels of liquidity with strong capitalisation as well as a healthy cost to income ratio which played a key role in the bank’s excellent performance. The Asian Banker Strongest Banks is an annual assessment of the financial and business performance of the commercial banking industry in the Asia Pacific region. The assessment ranks the top performing banks in each country by strength, an evaluation based on a belief that a strong bank demonstrates long-term profitability from its core businesses. Antonia Jasmine K of CCM ( far left) and Dk Izyan Tajudin of E-channels (far right) presented the prizes to the winners (L-R) : Ami Shah Ismawandi, representative of Reeda Malik and Hjh Mashaslinah Binti Hj Md Said. 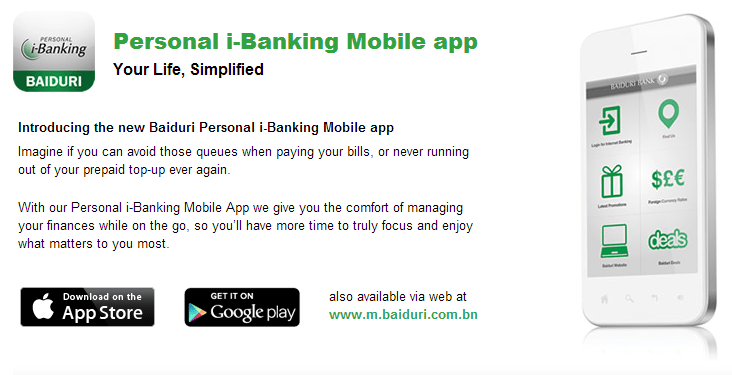 To mark the introduction of the Baiduri i-Banking mobile app in June 2013, Baiduri Bank launched a 6-month campaign to encourage customers to download the app and utilize it, with attractive prizes to be won. During the campaign, customers were automatically entered into the draw each time they carried out a transaction using the app. At the end of the campaign, three lucky customers who utilized the app were picked. 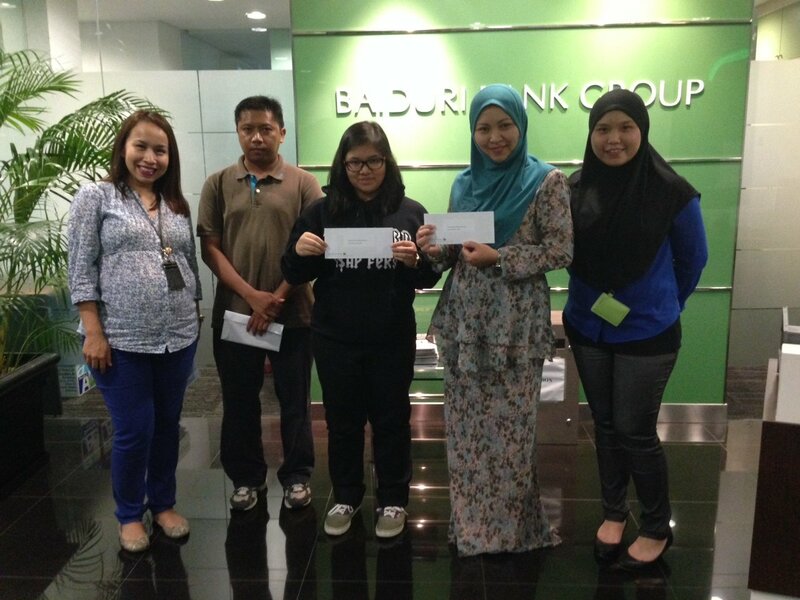 They received their prizes at Kiarong Branch recently. Hjh Mashaslinah bte Hj Md Said won a 2 nights stay at Empire Hotel while Ami Shah Ismawandi won an MasterCard CashCard preloaded with B$400 and Muhammad Reeda Malik, the AnakBrunei blogger who was represented by his daughter, won a B$400 AV Electronics gift voucher. Antonia Jasmine K, Senior Officer at the Corporate Communications and Marketing Department of Baiduri Bank was on hand to present the prizes. Since its launch, usage of the app has been increasing as more and more i-banking customers move to the mobile version because it is portable, making managing of their personal funds very convenient. As one of the delighted winners explained, “The mobile banking app is very convenient and easy to use”. The Baiduri Personal i-Banking app first made its debut in the market on 25th of June 2013 and was developed as part of Baiduri’s initiatives to continuously improve customer experience. Packed with existing i-Banking features, the app is available for download on App Store and Google Play at no charge. Customers can safely use this app while overseas because the app utilises the mobile or token authentication just like the existing i-Banking. More information on the latest Baiduri mobile app can be obtained via the Baiduri Call Centre at 244 9666 or online at www.baiduri.com.